If you have any questions or are in need or additional information, please contact Cinnamon Rossman at (920) 746-1359. The Land Trust’s mailing address is P.O. Box 65, Sturgeon Bay, WI, 54235. The Door County Land Trust is a non-profit organization under section 501(c)3 of the federal tax code. Your donation is tax deductible to the fullest extent of the law. The Door County Land Trust’s Federal Tax ID # is 39-1561423. 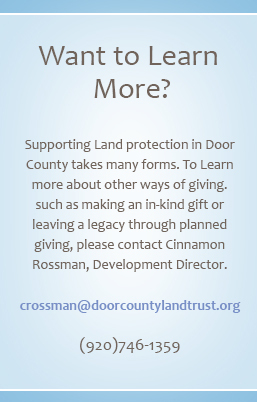 The Door County Land Trust is grateful for your support of land preservation in Door County.